Is It Time to Price in an RBA Rate Cut? Two days ago, our friends down under decided to keep rates steady at 3.0% for the second straight meeting. There was no surprise there, but market participants were caught off guard by the accompanying statement. Apparently, a rate cut might be in the cards! According to the Reserve Bank of Australia (RBA), even though the downside risks to Australia’s economy have abated, the inflation rate remains very tame. This left the door wide open for further rate cuts. This doesn’t mean, however, that the central bank will certainly be cutting rates. The RBA will have to look at Q1 data before deciding to cut rates or not. One of these is the retail sales figures. It came out yesterday and showed a disappointing 0.2% decline. The market had initially expected it to grow by 0.3%. This marked the third consecutive month of falling sales. Another important piece of data is the Chinese Manufacturing PMI. It, too, failed to meet forecast and came in at 50.4 versus 51.1. In any case, the recent data seems to be taking its toll on AUD/USD, which has dropped the past two days. Over the past few months, AUD/USD has struggled to trade above key resistance at 1.0580, indicating that the bulls just don’t have enough power. 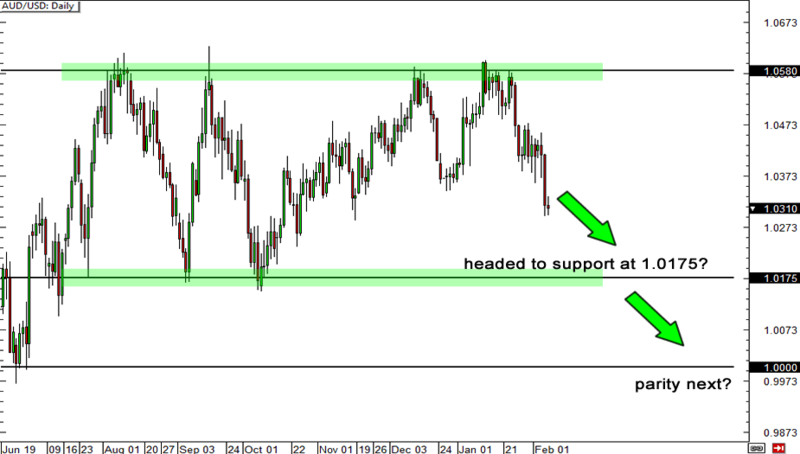 With the prospect of a rate cut now weighing on the Aussie, the focus could shift to the major support level at 1.0175. If the bears remain in control, we could see a test of parity by Q2! RBA Quarterly Monetary Policy Statement – We’ll probably hear another mention about how the current level of inflation may allow the RBA to cut rates down the line. Watch out for any mention about the recent decline of retail sales. MPC Meeting Minutes – This could provide some insight as to how many members are leaning towards a rate cut or how many prefer to remain steady. It could also indicate to us what particular data the RBA is paying attention to aside from inflation. Chinese Manufacturing PMI – The last report printed just above the line-in-the-sand 50.0 mark. A figure below that level could prove to be the final straw for the RBA before it pulls the rate cut trigger. Make sure you tune in regularly for the latest updates on the state of the RBA! What will cause the RBA to cut interest rates?